In my last post, I described some of the legislative hurdles for U.S. chemical regulation. How can Americans encourage positive change? The best ways to influence policy is through public support since legislators respond to their constituents concerns. Advocacy is an effective tool to raise public awareness and is most powerful when backed by research. A public opinion poll conducted in August 2009 for Safer Chemicals, Health Families showed that Americans are concerned with the way the U.S. currently regulates chemicals. When given a description, 74% say they support the Toxic Substances Control Act (TSCA). 87% expressed concern when they learned that chemicals in existence prior to TSCA were simply presumed safe and grandfathered. And 71% were in support of proposed changes for the legislation. This public support is being generated and maintained by advocacy. Advocates try to educate the public about regulatory issues through books, such as Not Just A Pretty Face by Stacy Malkan, which raises concerns about chemicals in personal care products, and Slow Death by Rubber Ducky by Rick Smith and Bruce Lourie, which examines how everyday items we use are polluting our bodies. 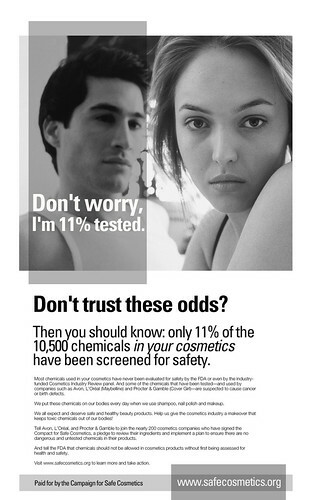 Advocates also use advertisements to raise awareness about harmful chemicals in makeup, from the Campaign for Safe Cosmetics, or cleaning products, from Method. In response to public concern, many companies have already begun to reformulate products, removing specific chemicals without government intervention. Two endocrine disrupting chemicals that have already begun to be phased out are BPA, which is used to make reusable water bottles, baby bottles, and carbonless paper receipts, and phthalates, a group of chemicals used to soften children’s plastic toys and to help fragrances last longer. However, a specific chemical being removed does not guarantee the new product is any safer. Manufactures simply swap one chemical for another, but just like the initial chemical, the alternatives are not being thoroughly tested for safety. It becomes a game of 'whac-a-mole', with every time you knock one down. Regulatory changes are critical so that we don’t have to remove dangerous chemicals from products, but instead are preventing them from getting to the market in the first place. What's the best way to ensure that the environmental chemicals we are exposed to are safe? Research. Stay tuned for the next part of this series on the benefits of Environmental Health Research. This is Part 8 Chemical Exposures and Public Health series. Part 4 - Something My Body Needs Anyway?